The new ETS Train Schedule for northbound services (ke utara) below shows all the new long distance routes that are now operating. The high-speed Electric Train Services (ETS) is now running from Gemas in the state of Negeri Sembilan, up to the Thailand / Malaysia border station of Padang Besar in Perlis. The last section of the track from JB Sentral to Gemas has yet to be upgraded and currently, only old diesel shuttle services can operate on this part of the North - South Railway Line. The left side of the timetable below is the Gemas - KL - Padang Besar route. The right side is the Gemas - KL - Butterworth route. Not shown in the timetable above are all the ETS Trains between KL Sentral and Ipoh. All the old long distance diesel Intercity Express Trains on the North - South Railway Line in Malaysia have now been cancelled from 19th May 2016, with only ETS Trains running between Gemas and Padang Besar. New Shuttle Train services are now connecting to the ETS services at Gemas to take passengers to/from JB Sentral in Johor Bahru and Singapore. Trains between Padang Besar and Butterworth are now operated by KTM Komuter Trains. Making an advance booking for ETS Trains is highly recommended as some routes can be fully booked, well before the departure date. 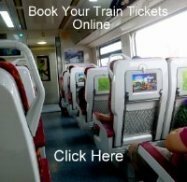 Booking train tickets in Malaysia is fairly straight forward. You can buy advance tickets from any KTM ticket counter at all the mainline stations or you can book online for the same fare.